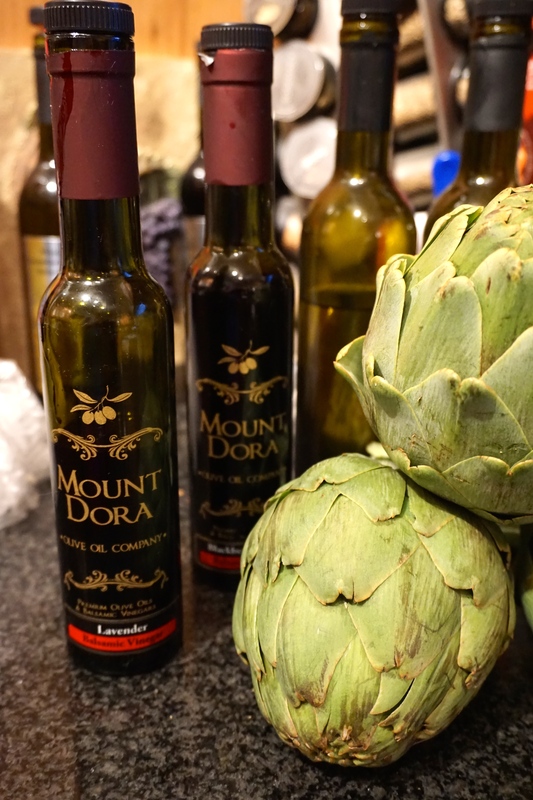 Anyway, for those of you who might be wondering where the artichoke comes from here is a little bit of history. 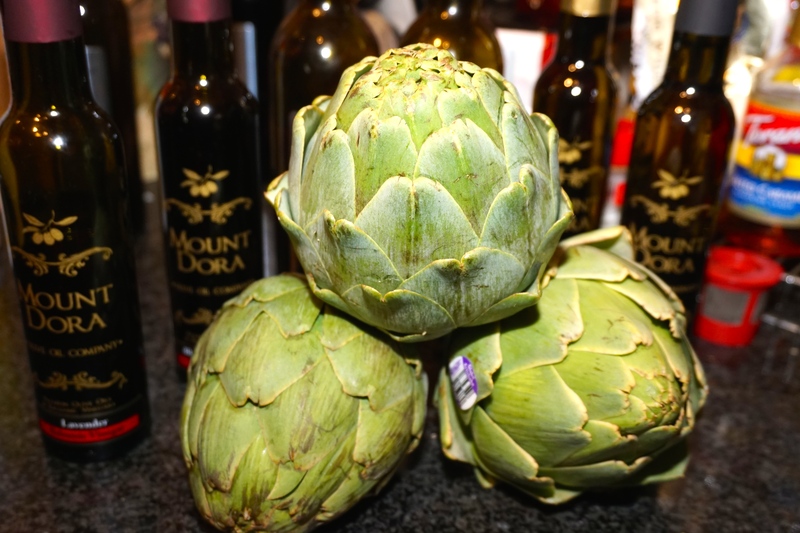 The globe artichoke is a variety of a species of thistle cultivated as a food. The edible portion of the plant consists of the flower buds before the flowers come into bloom. The budding artichoke flower-head is a cluster of many budding small flowers together with many bracts, on an edible base. Once the buds bloom the structure changes to a coarse, barely edible form. Another variety of the species is the cardoon. It is a perennial plant native to the Mediterranean region. Ok, so now that we are done with the artichoke history lesson, here is how I prepared this delicious flower for tonight’s dinner. 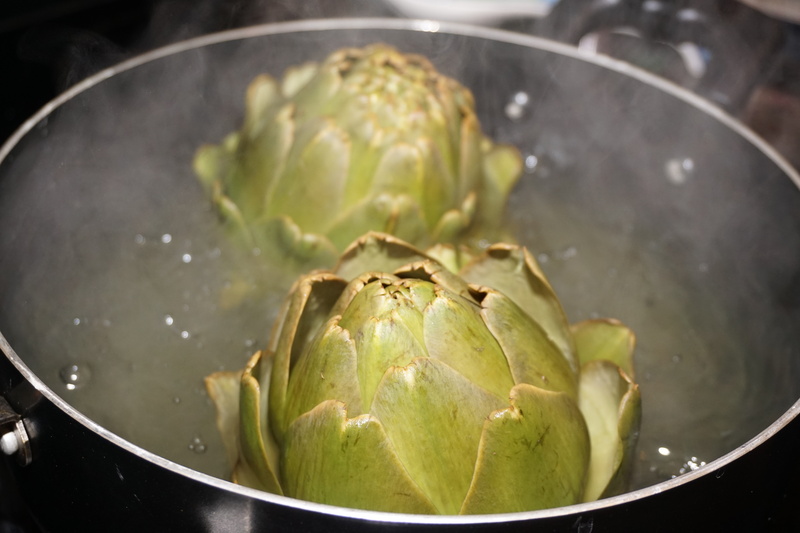 First of all you start by cutting the stalk so that they kind of stand flat, then you fill up a pot with water, add some salt, add the artichokes and bring to a boil. Do not cover them! I let them boil for just under an hour and test their readiness by poking a knife at the bottom to make sure its nice and tender. Remove from boiling water and place on a draining rack upside down to make sure that all the water goes bye bye. 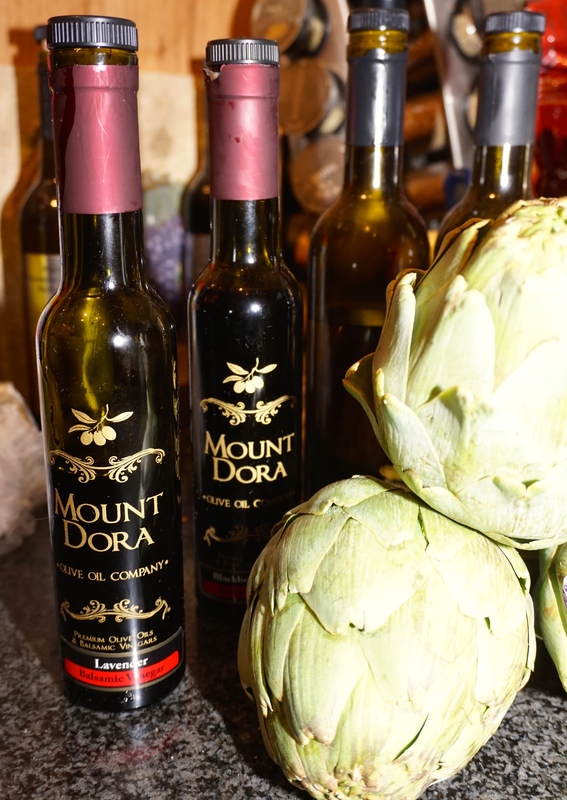 Prepare your favourite vinaigrette, which I did today by using some olive oil and my fabulous Blackberry Ginger Balsamic Vinegar from the Mount Dora Olive Oil, some dijon mustard and a few capers. 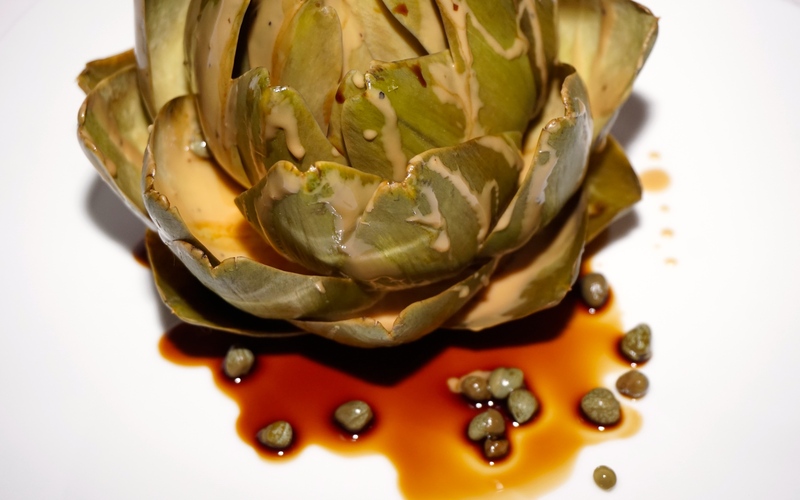 I drizzled some of the Blackberry Ginger Balsamic vinegar at the bottom of my plate, then placed my artichoke and carefully opened it up so that when I drizzled my vinaigrette it kind of seeps into every nook and cranny! 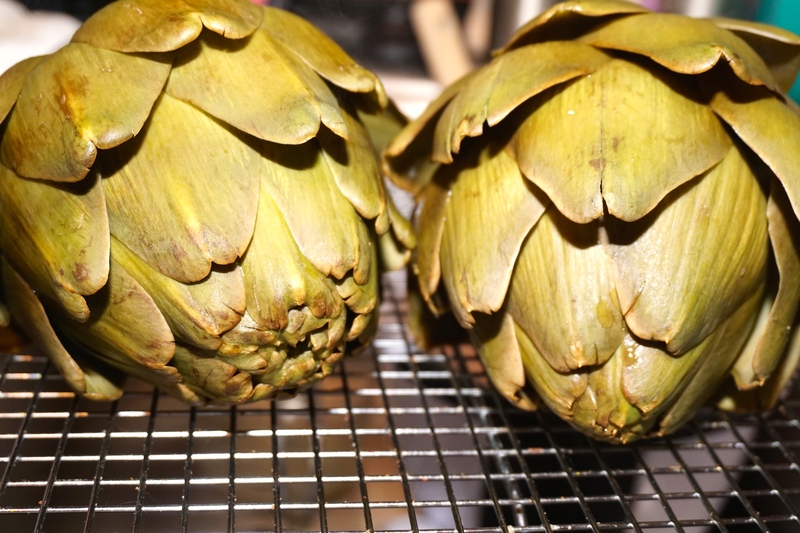 The artichokes turned out delicious. I love eating the petals one at a time and look forward to that lovely flavorful heart, but the star of the dish was the vinaigrette! I nearly licked it off the plate, but being the lady that I am, I finished it off with a teaspoon :-)! Thinking my friend Ann and I might need to prepare some of these to take over to The Wine Den on my next visit as the Balsamic Vinaigrette would pair wonderfully with their fabulous wines <3!